Puppets take the stage and act out a white man’s eulogy regarding the death of his black friend, unfolding as a series of vignettes and memories about his life before it was brutally taken by the Ku Klux Klan. The small figures bring to life part of the United States’ dark, racist past. 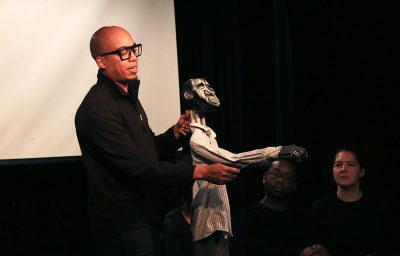 Puppeteer Tarish “Jeghetto” Pipkins worked with a cast of puppeteers from Boston to create “Just Another Lynching: An American Horror Story” Thursday and Friday evening at the Puppet Showplace Theater, located in Brookline Village. The show was part of the theater’s “Puppets at Night” series, aimed at teen and adult audiences. Pipkins made his Boston debut last week when he participated in a residency that included six events with Boston University’s Arts Initiative and the School of Visual Arts through the College of Fine Arts. “Just Another Lynching” was created and written by Pipkins but performed by local cast members of the Puppet Showplace Theater, he said. Roxanna “Roxie” Myhrum, artistic director of the theater and a performer in the show, said she found the experience to be very haunting. A visual artist his whole life, Pipkins began pursuing puppetry in 2003 when he created his first puppet while working on a wire sculpture. Prior to that, the Pittsburgh, Pennsylvania, native worked as a barber. In 2008, he began working with Paperhand Puppet Intervention, which seeks to promote social change through utilizing diverse styles of puppetry and artistic expression. When asked about recurring themes in his work, Pipkins said one was social justice. He said he chose to create this piece on racism in America because it was a topic he had widely researched for many years, beginning from when he was working in a barbershop as a teenager in Homewood, a neighborhood in Pittsburgh. Pipkins said his brother owned a bookstore and would give the the future puppeteer three or four books at a time about the history of racism in America. “Just Another Lynching” was set during the Jim Crow era, but the creator of the production applied the ideas in it to modern day events. “One-hundred years ago it was cool to [lynch] someone, but now it’s cool to be a police officer and murder someone who doesn’t have a weapon because they are black,” Pipkins said. The show was followed by a open discussion between the performers and the audience, where the audience was encouraged to respond to the performance with an “I feel” statement, as well as any questions and comments they might have. Pascale Florestal, 27, of Malden, said that she felt the play conveyed a feeling of oppression and racism in an unexpected way. During the discussion, Pipkins revealed that he had a major time crunch in creating the show: 30 days. He said he had only that amount of time to make the puppets and put everything together before the live performance. The show was sold out both nights, according to Myhrum, and the audience members included a range of ages, professions and races. Jeghetto said there isn’t one answer to the problems he addressed in the show.